Kookoo is also spelled KuKu and please don’t take this the wrong way but you will be coo coo not to try it. As Dr. Seuss said: “If you never did eat kookoo you should. These kookoo things are fun and fun is good.” Alright, I’ll come clean, Dr. Seuss didn’t exactly say that, but I am pretty sure he would have, had he had occasion to sample a kookoo freshly made by an Iranian kadbanoo. But what exactly is a kookoo? I like to picture kookoo as the love child of a quiche and a soufflé … they met cute and it happened, ok? But kookoo also bears a semblance of resemblance to a frittata, fritter, omelette or even a pancake! Let’s cut to the chase and call kookoo the Zelig of egg dishes. But ultimately, kookoo is neither a quiche nor a soufflé nor a frittata or fritter or pancake. It is its own thing: a genre of Persian food made with whipped eggs mixed in with various types of vegetables and fresh and dried herbs, and sometimes with chicken or meat or even fish (kind of like a crab cake) and cooked either on the stove or in the oven. Variations abound! We have garlic kookoo, eggplant kookoo (one of my favorites – yum), green bean kookoo, potato, meat, and cauliflower kookoo, and a bunch more besides. 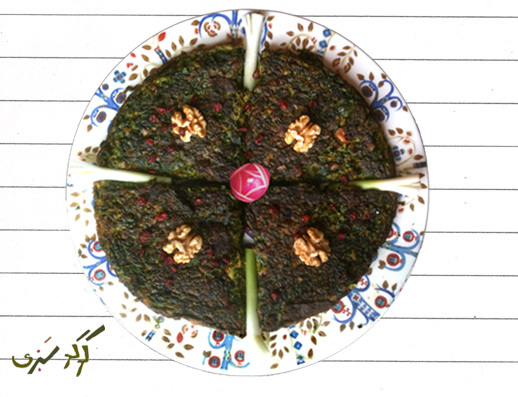 Of all these, Kookoo sabzi (green herb kookoo) is one of the most popular iterations, a year-round staple menu item that is also made specially for the Persian New Year because it is green and thus symbolizes growth and spring. A good kookoo sabzi is a thing of beauty: fluffy, fragrant, hearty yet light, filled with nutrition, and absolutely delicious! 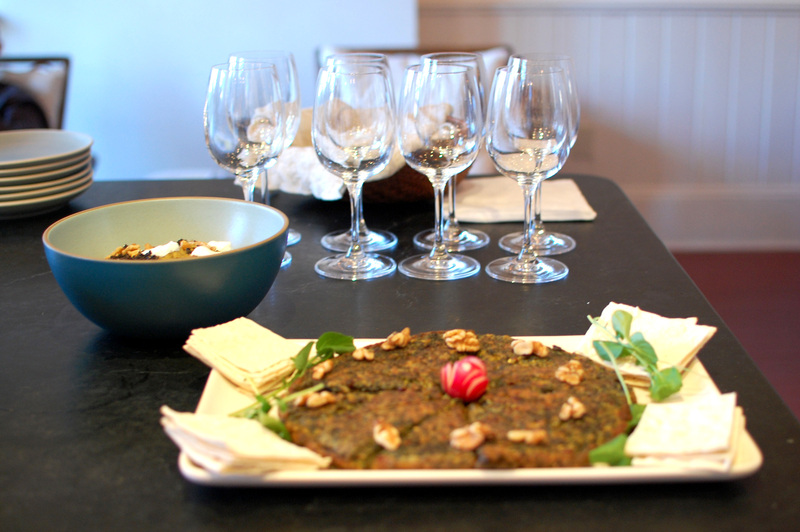 The contrasting play of the tangy berberries and crunchy earthy walnuts in a bite of fluffy herb-infused kookoo sabzi, partaken with yogurt and some bread, is poised to delight even a persnickety palette. 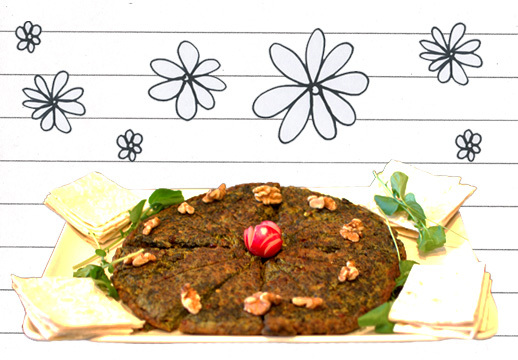 But enough of just singing kookoo sabzi’s praise – let’s get cooking and make some! In a big bowl crack the eggs. Add flour, salt and pepper. Beat lightly with a fork. Add chopped sauteed fresh herbs, dried mint & dried tarragon (or dried fenugreek), dried dill, chopped walnuts, barberries, baking powder, turmeric, and the sauteed herbs. Mix well. For the garnish: heat 2 tablespoons of oil in a small skillet over a medium flame, add sugar (optional, skip it if you like tangy flavor like we do) and 1 tablespoon of barberries, and stir well for just under and no longer than a minute. Sprinkle barberries over the kookoo when it’s ready to serve. Make it, enjoy it, and noosheh jan, we say! 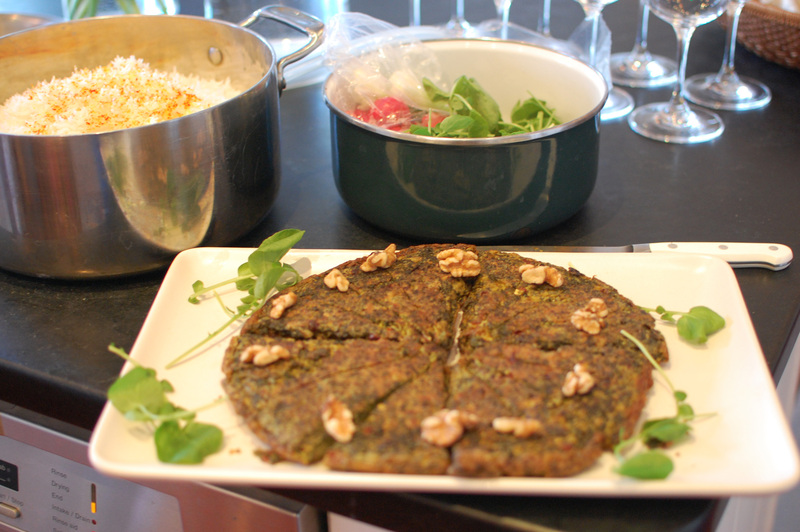 Fun Fact: Kookoo sabzi was one of dishes served at the White House Passover dinner this year. Merci …lotf kardid barayeh visit! This sounds delicious, especially as I’m really into herbs at the moment. 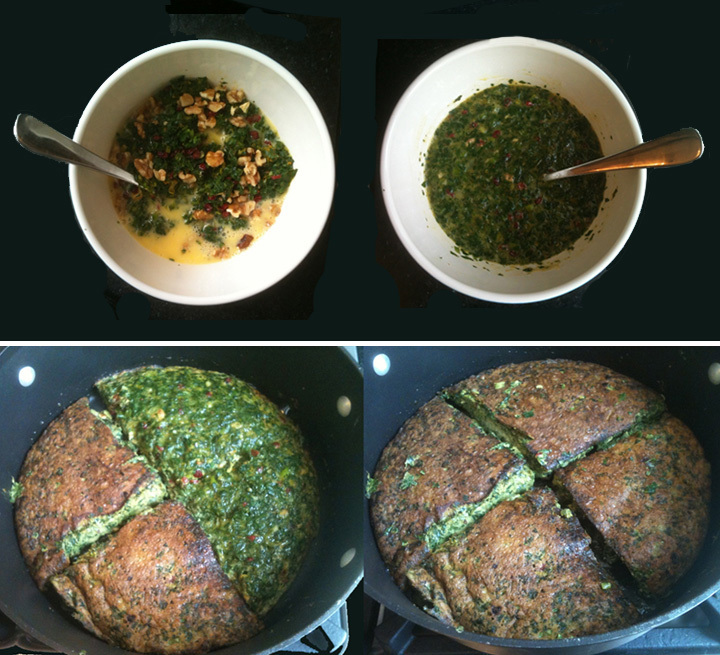 Oddly, I have a recipe from several years ago called herb eggeh – not dissimilar. Can’t remember where it’s from, though. Ohhh this looks great! I love the way you do the photos with the drawing added to them… super creative and fun! I have never heard of Kookoo but it sounds so interesting. Frying the batter on the stove sounds so intriguing. Looks delicious! This is a very popular dish and genre of cooking for Iranians. Give it a try if you get a chance! I am half Iranian & half american and I just wanted to let you know your blog really makes me feel close to my Iranian heart*soul*mind. It helps soothe that burning yearning to jump in a flight right this second thats heading straight to Iran. Today I was feeling especially inspired by your kuku post, and decided what the heck Ill give it a go! Im 22, and have had been blessed with 22 years of Iranian food (buying out, family preparing, etc) but I have not often tried my own hand at it, especially Kuku. p.s. try a pinch of lime or lemon next time. I put some in and it gave a nice kick!! Hi dear asya! First, I love your name! Second. I also fight a burning desire to jump in a plane and head to Tehran, so I completely relate – oh so much. And finally, I’m thrilled (filled with warm and fuzzy feelings) to read that this blog makes me feel close to your Iranian side. I can’t wait to share it with my mom and I mean this is why the work on this blog is ultimately so worth it. I’m also really happy to read that you first foray into Persian food came out well. Kuku sabzi was a great choice, it’s delicious and not that fussy, and I like the idea of using yellow raisins instead of berberis. It will be a sweeter version but still really balanced with the walnuts and herbs and sounds delicious and I’ll have to give it a try myself, plus that kick of lime/lemon you recommend. Anyway asya jan, noosheh jan, and just know that you comment made my day and has planted a firm smile on my face! : ) Much love back to you too! and p.s. if you or your family ever feel like writing a guest post recipe on this blog, I’d be more than delighted, and just give a holler! pps keep in touch, OK?